Naturally, the best way to test a product is to experience it first hand. Brands are finding the magic in hosting media outlets to experience their product in unique ways. Lucky for us, we get to take part. 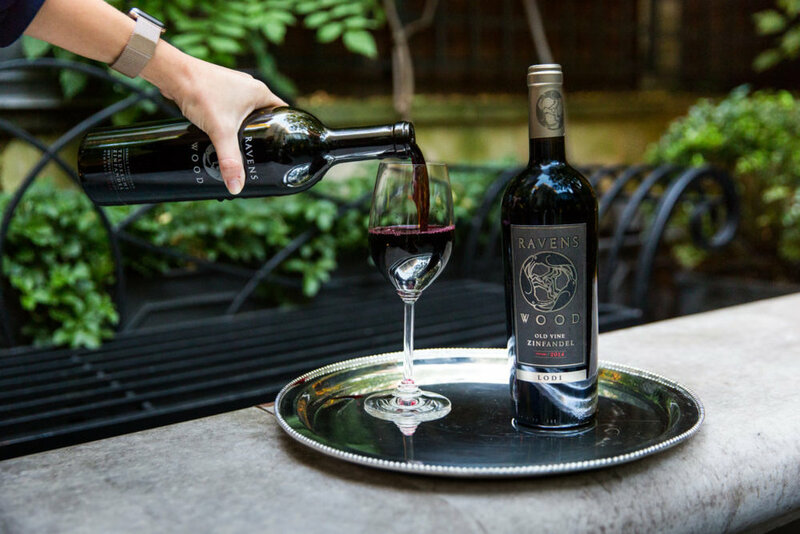 Earlier this week, we worked to throw an event for Ravenswood wine. 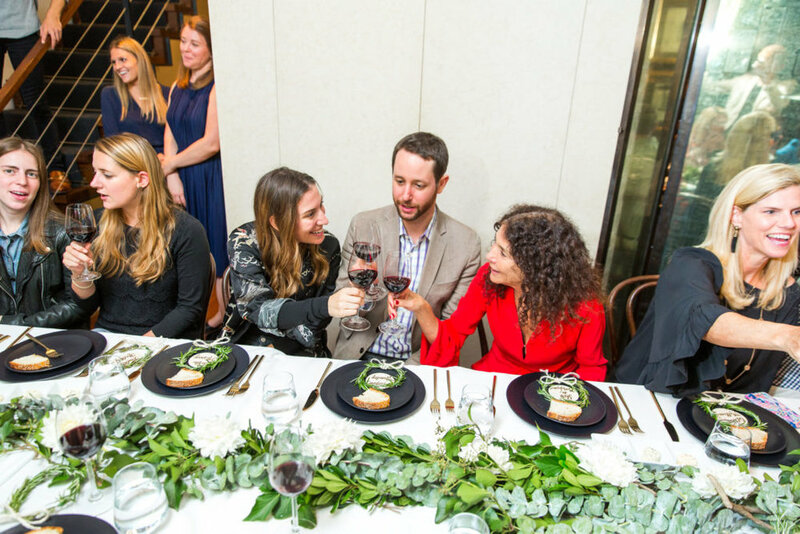 They rounded up a stellar list of editors who spent the night sipping on wines paired with delicious food. 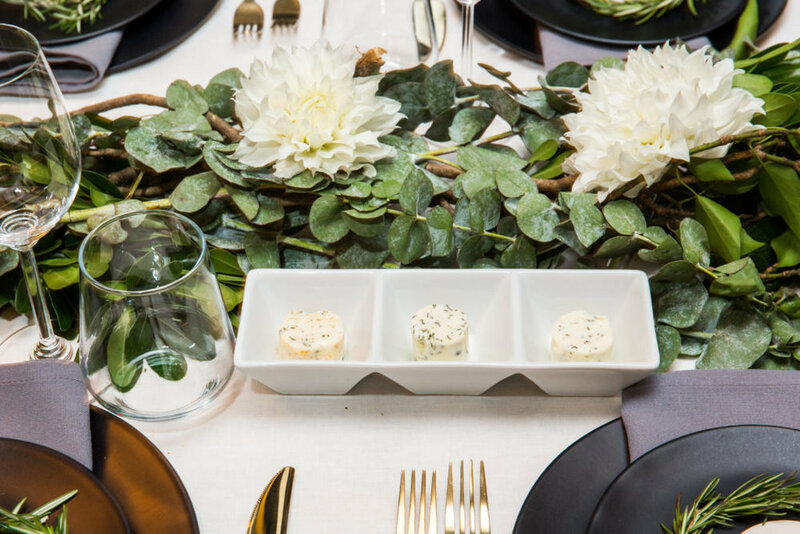 The event was held in a West Village Townhouse that the Ravenswood team rented through One Fine Stay. It was spectacular. Several floors, an outdoor garden and a beautiful kitchen to work within. The concept, was the holidays. 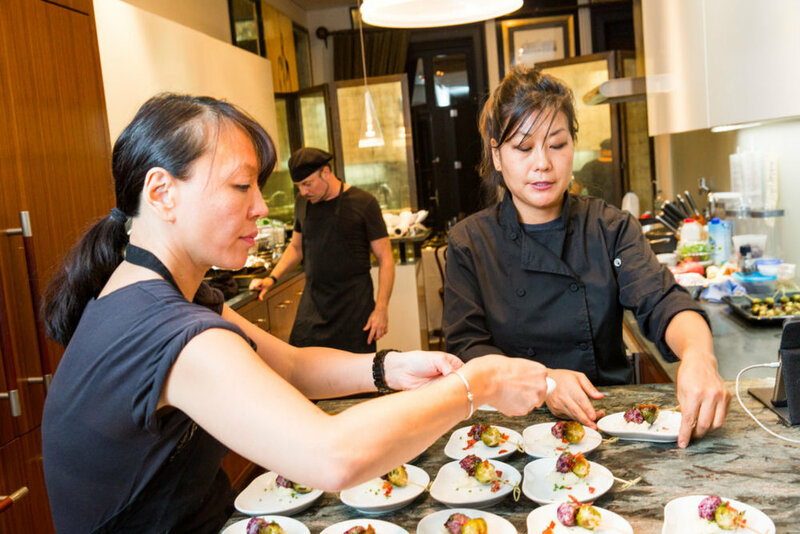 We brought in one of our favorite personal and party chefs, Chef Sue Park, to create a menu of dishes that would pair with each holiday and wine. 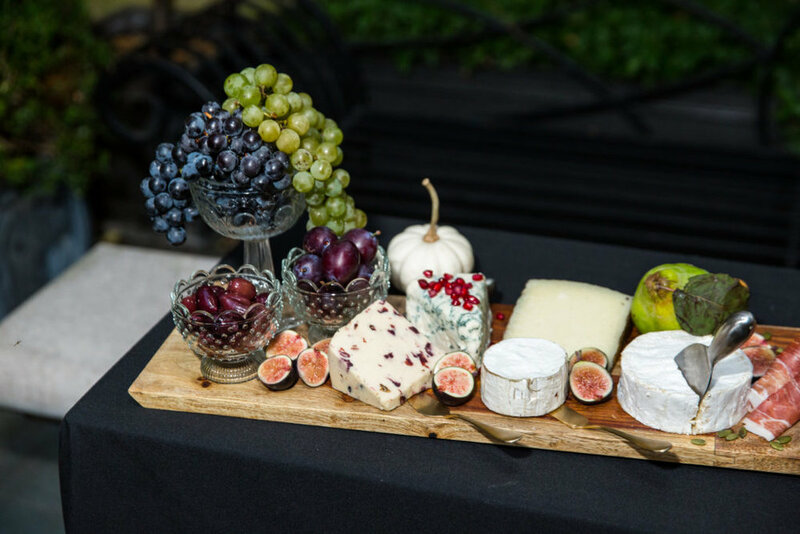 When the guests arrived they were welcomed into the garden for the first wine tasting and an Autumn inspired cheese + charcuterie board. The guests were then taken into the living room where we styled fall florals for "Thanksgiving". Chef Sue nailed the tasting here serving Rosemary Thyme Turkey Meatballs with Blueberry BBQ Glaze and Mashed Potato Puree which paired perfectly with the Lodi Zinfendel wine that the guests were tasting. Chef Sue also included a Roasted Brussel Sprout with Maple Glaze and Prosciutto Chip Flakes on the skewer with that meatball. Next up, was Hanukkah. 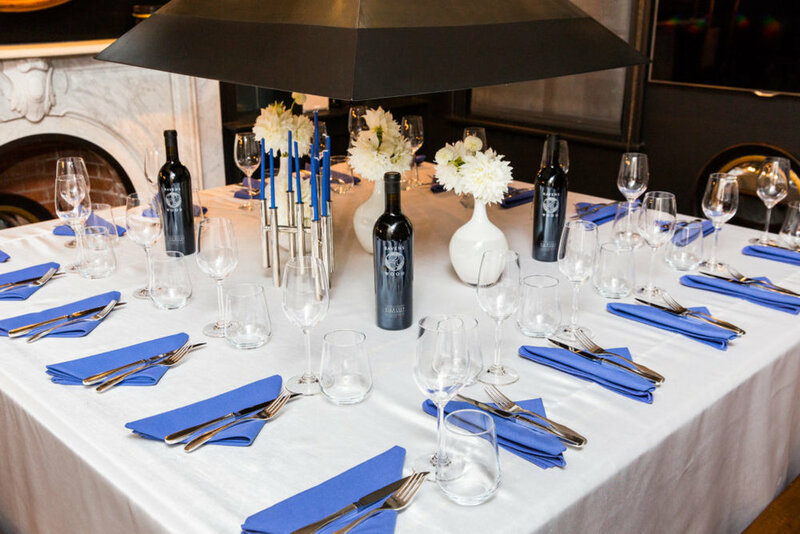 We kept the table tasteful and festive with white, blue and silver accents. 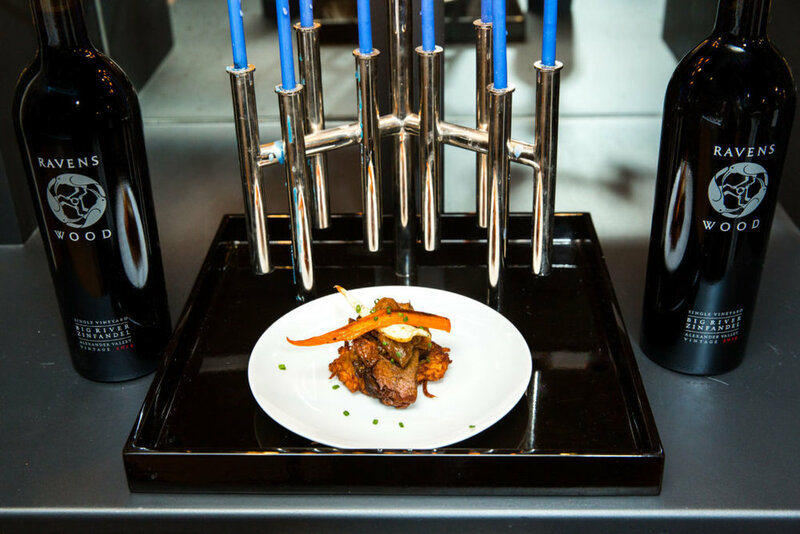 Chef Sue plated a Sweet and Savory Braised Brisket with Figs & Apricots Served with Potato Latkes for this holiday pairing. After testing out her brisket I have officially decided to hire Chef Sue for my next Jewish holiday dinner party! My favorite setting of the night was Christmas dinner. 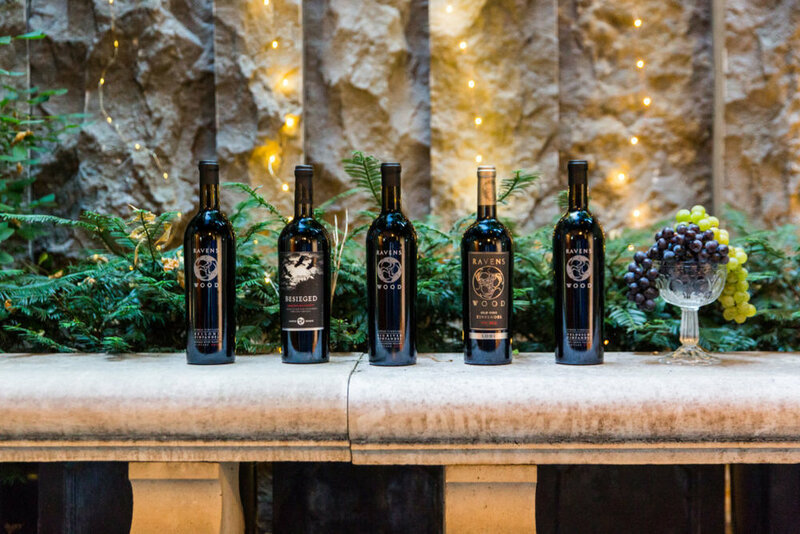 For this tasting the clients were hoping for a more elegant but not overly "Christmas" table. 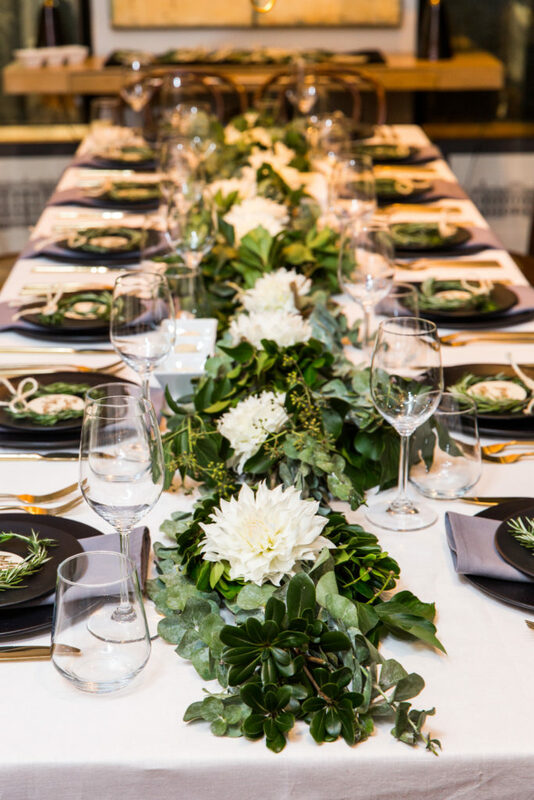 We used black matte plates, gold flatware and greenery to line the center of the table. 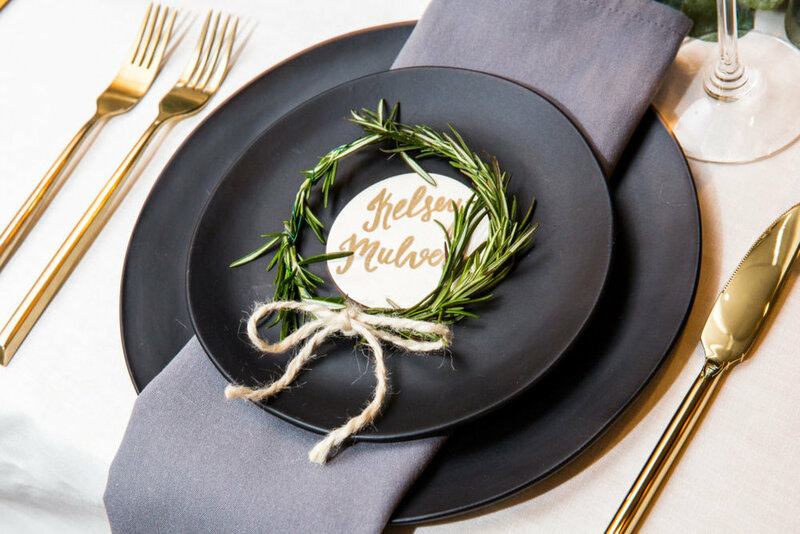 Our very own Crafty Maggie made rosemary wreath place cards with every guests name written in gold making it clear that this table represented Christmas. It all came together so beautifully. For Christmas dinner Chef Sue prepared a family style meal starting with Rustic bread and a compound butter series: Garlic sage, Lemon zest thyme and rosemary paprika. The meal was followed by a Holiday Seasonal Salad with Shredded Kale, Roasted Shaved Acorn Squash, Sliced Medjool Dates, Parmesan, and a Honey Balsamic Vinaigrette. 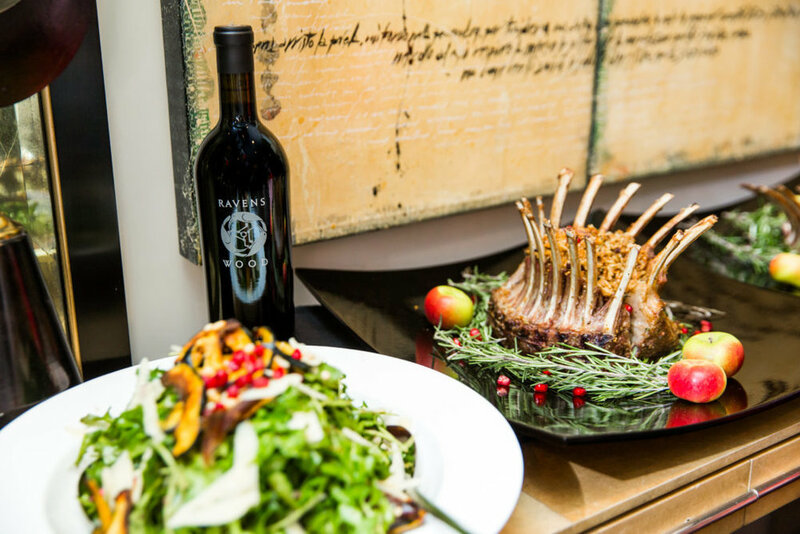 The guests then enjoyed Chef Sue's Rosemary and Fennel Crusted Crown Roast of Lamb Chops. Crown that was stuffed with Currant Rice Pilaf. Last but certainly not least, Happy New Year! 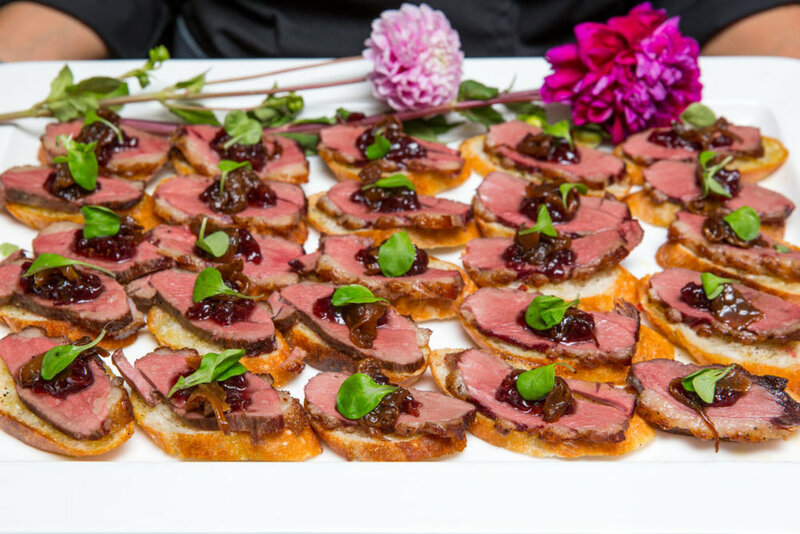 As the final course guests enjoyed a Decadent Crostini with Seared Duck Breast, Caramelized Onions, & Teldeschi Cherry Chutney. Was the perfect send off for the most fabulous evening. 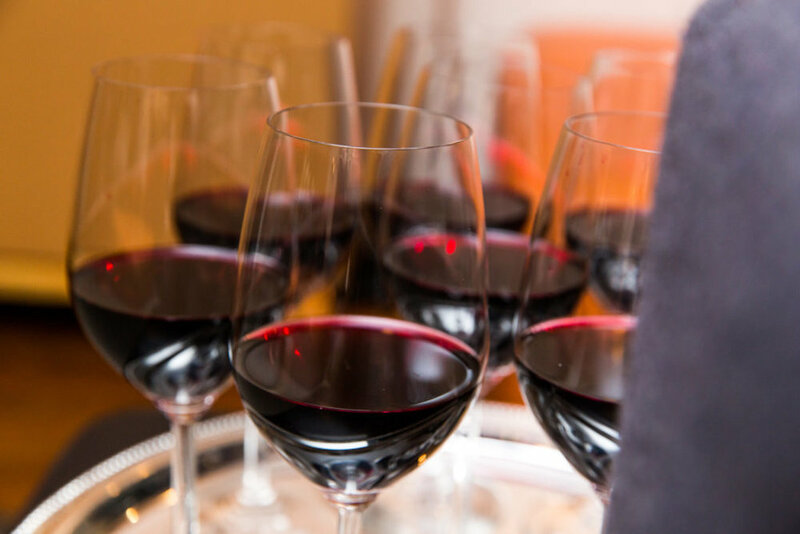 The event was such a special one where the guests made new friends, sampled incredible food and sipped on red wine for the night. Doesn't get much better than this!